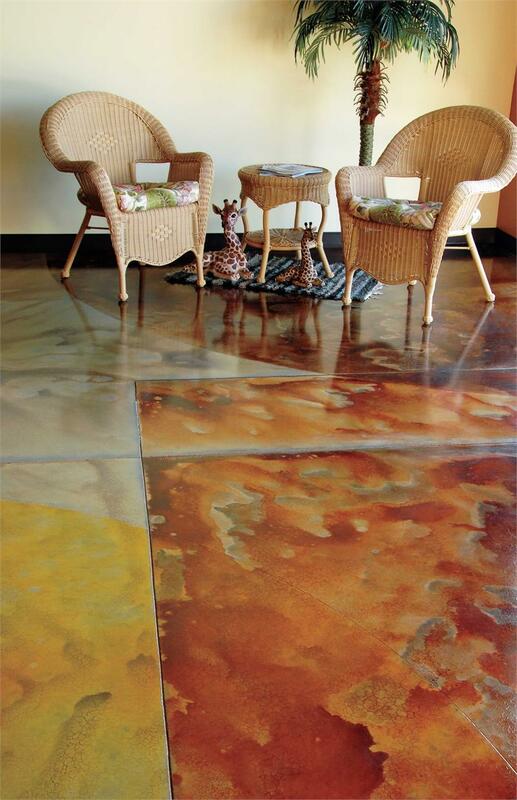 Color Stain can be applied to any absorbent concrete surface as well as some natural stones. The stains come as a concentrate and can be diluted with distilled water from a ratio of 4:1 up to a ratio of 32:1 to obtain different levels of transparency and color intensity. They are a great replacement for acid stains because they do not contaminate the environment and do not require acid neutralization after application. They are simple, safe and fun to use. The stains can be applied with many different application tools including airless sprayers, hand pump sprayers, sponged or ragged. They create great faux color variations. All stains are made with the highest quality raw materials, superior manufacturing, and are used world-wide for functional and decorative art. It is recommended to prepare the concrete with SealGreen Color Stain Primer Cleaner. We did a different application this time because of some concrete floor issues. We rolled the Classic Gray on (2) coats then mist sprayed Classic White over the top of it. It came out beautifully. The White link to picture http://sealgreenalbum.jalbum.net/SealGreen%20Photo%20Album/#Family%20room%20stained%20with%20Classic%20Gray%20and%20Classic%20White.jpglightened/mixed with the Gray and ended up being a mid to lighter shade. Have been using Smith Color Floor for years now and have never had a bad experience with it. Tell Mike I put down the 2 bottles of Desert Sand Smith’s paint on the stoop. Looks wonderful. Seal will come later, perhaps this weekend. The broom-brush worked great, too. The staff is great to work with. Very knowledgeable about the products they sell. Color came out great. Unit did not go as far as I expected and had to order another one. Probably because I spread it too thick. This is a good product and help is but a phone call away! Came to your training classes in 2009 and stained our old, crummy-looking back patio with your products. Now we LOVE it. Everyone who comes over just loves it. It is absolutely the nicest thing we have ever done for ourselves. We enjoy it so much. It turned out great, you were a big help! Thank you! Sent from my iPhone (Project included stain primer to prep floor, color stains, E10 Epoxy sealer and W10 Finish coat for high gloss look).